Medan is a fascinating multicultural historical city. As there are many ethnic groups living in the city, such as the Javanese, Minangkabau, Batak, Indians, and Chinese, the city is an example of a multicultural and multi-ethnic society. Tri Jaya Tour & Travel provides special architectural tours along the various ethnic neighborhoods and will guide you to pre-war historical buildings. Medan is the capital of the province of North Sumatra. The plantation industry, that started in the 1870s, is an important part of the history of the city. Money was made by exporting tobacco, rubber and palm oil. To this day, impressive buildings remind of these glory days from the colonial times. The most famous buildings from before 1940 are the palace of the Sultan of Deli, the Great Mosque and the House of Tjong A Fie. Today, Medan is a fast-growing city with modern high-rise apartment buildings, large hotels, and many shopping malls. In addition, Medan still offers heritage buildings. This makes the city of Medan particularly interesting. Around the central square, the ‘Esplanade’, are the most important buildings of Medan located. Here was the office of the Java Bank, build by the architectural firm Hulswit, Fermont & Cuypers. Next to it was the town hall from 1908 with the clock tower, which was donated by the wealthy Chinese businessman Tjong A Fie. A bit further down the road was Hotel De Boer, build in 1898. So far a quote from the novel Rubber by Madelon Székely Lulofs. The remarkable thing about Medan is that almost all the buildings from the literature are still there. They are not torn down. 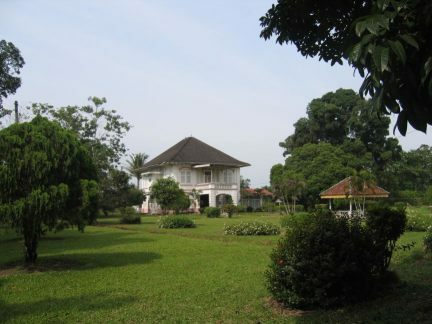 The big villa of the Huelsen family in Tanjung Morawa still exists, Hotel De Boer, the office of Harrisons & Crosfield, the house of Tjong A Fie, we can still see it when we drive through Medan. The bestseller of the Dutch writer Geert Mak ‘De Eeuw van Mijn Vader’ (The Century of my Father), partly played in Medan. Just like the Mak family, there are countless Dutch people who, in one way or the other, have ties to this city. It was a part of The Netherlands, with all positive and negative sides, with Dutch names, companies, and buildings designed by Dutch architects. Sumatra has one of the greatest unspoiled rainforests in the world. There are small towns where time seems to stand still, like Sibolga. During the trip from North to West Sumatra via the ‘Trans Sumatra Highway’, right through the jungle covered mountain ridge Bukit Barisan, is absolutely unforgettable. 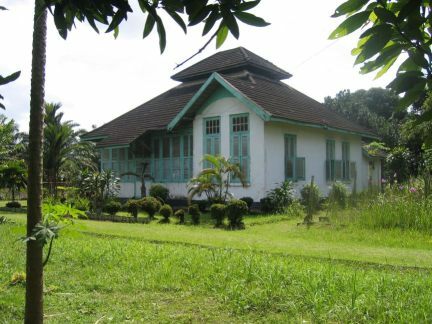 Everywhere are old plantation houses, schools and plantations to be found that reminds of the Dutch colonial history. These are the “bittersweet memories” of a former Dutch colony. It has not disappeared, you can still visit it. •Harm Kamerlingh Onnes belonged to the Leiden artistic circle. In 2001, there was a special exposition about the work of Harm Kamerlingh Onnes in the museum De Lakenhal in Leiden, the Netherlands.